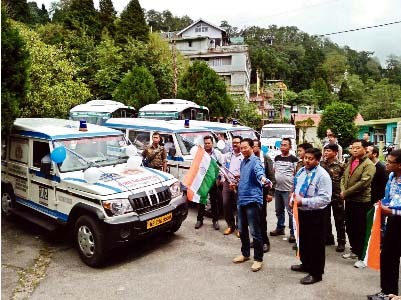 Darjeeling: Four new ambulances were flagged off on Monday by the Chairman, Gorkhaland Territorial Administration, Darjeeling. "The ambulances are under the Maternal and Child Health Services. The Chief Minister, who is also the Health Minister, has taken special initiative for the reduction of infant and maternal mortality and morbidity under the National Health Mission. These ambulances will ply in the Gorkhaland Territorial Administration (GTA) area," stated Dr Pralaya Acharya, CMOH, Darjeeling. While 2 ambulances will run from the Darjeeling district hospital; 1 from Kurseong sub division hospital and 1 from Kalimpong district hospital. "It is our endeavor to upgrade health services in the Hills. One can avail the services by dialing the toll free number 102. Shortly a trauma centre will also come up in Darjeeling hospital, the services of which can be availed by dialing 108. The ambulances are for expecting mothers and children below 1 year, specially from the weaker section. The nursing staff, technicians and even the driver of these special ambulances are trained. They can offer medical aid. Delivery can also be done in these ambulances, hence a lot of lives can be saved, specially patients coming from far flung areas," stated Binay Tamang, Chairman, GTA. Recently, a dialysis unit was introduced in the Darjeeling hospital and CT Scan facility will be made available soon.